At the end of the Season 1 finale of Project Blue Book, J. Allen Hynek is a man on his own. Following the Washington Flap -- a series of famously well-documented real-life UFO sightings in 1952 fictionalized on the show -- he is warned by mysterious allies they can no longer protect him. 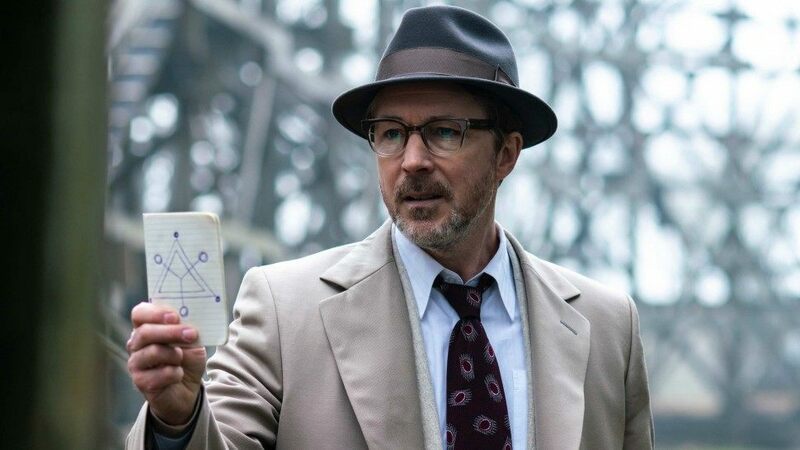 But as Hynek looks to the stars from his observatory, Aidan Gillen, who portrays the UFO researcher, is looking ahead to the second season of the History show. Gillen didn’t know about the Season 2 renewal when the finale ended on that cliffhanger, which also showed Hynek – in a move worthy of the actor’s character Littlefinger from Game of Thrones -- apparently doublecrossing his partner Quinn (Michael Malarkey), only to reveal he was actually pulling the wool over the government’s collective eyes. Set in July 1952, Gillen called “The Washington Merry-Go-Round” a sensational “movie-sized” episode, and indeed it aims for the sky with action sequences involving fighter jets, a possible invasion of the nation’s capital, a car bomb, a lot of Men in Black, and President Truman played by the excellent character actor Bob Gunton. The so-called “Invasion of Washington” made headlines such as “Saucers Swarm Over Capital” (The Cedar Rapids Gazette); “ ‘Saucer’ Outran Jet, Pilot Says; Air Force Puts Lid on Inquiry” (The Washington Post); and “Jets Chase D.C. Sky Ghosts” (Daily News). And they really did attract the attention of the president. However, within the show, the events seem to likewise impact the fictional version of Hynek, even though he dismisses the UFO as temperature inversions. But, based on the note of warning he receives in the episode’s final moments, there is an added threat to Hynek if he continues his mission to find answers. That’s where his Littlefinger maneuver comes in, and points the way to a character willing to lie when needed. But Hynek is also an academic, and family man, which raises the question as to why he would put himself at risk by continuing to research, and play both sides. While the actor said he doesn’t know where Season 2 will take Hynek, and Project Blue Book, because he has yet to see scripts, Gillen said his character is a changed man. “What he has seen is going to trigger an obsession with finding out what that was. Are these visitations for real? Are these other civilizations visiting us? Or something else ... interdimensional intrusion, or stuff the real Hynek did, and looked at as well, like time travel."